Physiotherapy and rehabilitation play a crucial role in the management of patients that have spinal injury or require spinal surgery. Spinal injury may be sustained through trauma such as being hit by a car or falling from a height, often causing spinal luxation or fracture and varying degrees of spinal cord trauma. Surgery may be required to decompress the spinal cord or stabilise affected segments in the spine. Another common reason a patient will require spinal surgery is for intervertebral disc disease that is causing compression on the spinal cord, leading to pain and loss of motor function and / or sensation in the limbs. A decompressive surgery will be required in an effort to prevent further spinal cord trauma, reduce pain and restore mobility. 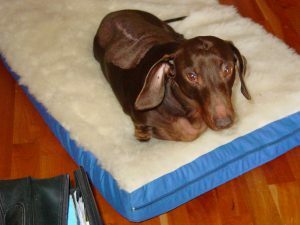 The presentation of the dog both before and after surgery will depend on the severity and chronicity of the conditions. The longer the spinal cord is compressed and the more severe the compression, the more severe the deficits to the limbs will be. In the mild cases the patient may present with mild proprioceptive deficits, not being aware of exactly where their legs are in space, but still ambulatory. As compression increases the patient may become painful, and weakness may be evident on ambulation. In severe cases no motor function may be seen in the limbs, making the patient unable to walk. In the most severe cases, no deep pain sensation is evident in the limbs affected. Conservative treatment may be used in very mild cases with just back pain and mild proprioceptive deficits. These are usually treated with cage rest without medication, then anti-inflammatories if no response for second or third episodes. For dogs presenting with several episodes of back pain, proprioceptive and ambulatory deficits, inflammatories may be used initially but if the response is poor then decompressive surgery is recommended. In patients with gross pain, proprioceptive and ambulatory paraparesis, decompressive surgery is recommended, and often has a good prognosis. Those with no motor function up to 2 days have a poorer prognosis with decompressive surgery, and those with no motor function or deep pain for greater than 2 days have a poor to grave prognosis even with surgery. Need a physiotherapist for your beloved best friend? Whether your dog is an older dog, a sporting dog, or an injured dog, the team at Dogs in Motion Canine Physiotherapy are here to help get your best friend back on their feet as quickly and safely as possible. Physiotherapy and rehabilitation are imperative to the success of either surgical or conservative management of patients with spinal injury or surgery. If patients are non ambulant, rehabilitation is vital, so as to attempt to restore mobility as soon as possible. At Dogs In Motion, we will work with the veterinary surgeon to provide your pet with a tailored intense rehabilitation program, specific to your pet’s needs and time since injury or surgery. Treatment typically includes exercises for sensory stimulation and to facilitate return of neuromuscular control in the limbs, manual therapy techniques such as massage and joint mobilisation, modalities such as heat and ice for pain relief, electrical stimulation to increase muscle contraction, balance and coordination exercises and techniques to re-teach ambulation Supportive harnesses, wheelchairs and protective booties for feet may be prescribed if needed. Advice on appropriate bedding and pressure care will be provided to ensure your pet is well supported. Hydrotherapy plays a vital role in the rehabilitation program following spinal injury or surgery. Depending on the severity of injury, your physiotherapist may choose to go inot the pool with your pet to assist the limbs, have your pet sim independently, or take them into the underwater treadmill to re-teach walking. This is ideally performed 3-5 times per week depending on severity. A customised home exercise program will be provided at your pet’s initial evaluation, so you can continue therapy at home on a daily basis. This will also include an outline of exercise restrictions specific to your pet’s stage of healing and your home environment. As you pet progresses a walking program with be added. Regular reviews with your pet’s physiotherapist are important to ensure your pet is progressing correctly. At these appointments, your pet will be reassessed and their home exercise program will be progressed as they improve. As healing progresses, your physiotherapist will help guide your pet back to normal exercise. Overall, the prognosis in most cases of spinal injury / surgery is good if they have received veterinary intervention early. The critical issue in ensuring a good outcome is having an owner that understands the importance of intense rehabilitation and strict exercise restriction and adherence to a physiotherapy and rehabilitation. Depending on severity of injury, rehabilitation may last from as little as 2 months or may go to 6 months +. Some patients may be left with ongoing deficits in walking, and these often need to continue some form of rehabilitation long term.